Some surfers may wonder at the title of this blogpost. Does it reflect malice on the part of the Author? I would say it does! Some malice can be justified, and there are so many reasons to dislike the irrationality of the bulk of Objectivists… those whom emulate their Icon to the greatest degree. I must take care not to collectivize all Objectivists into one lump, as this type of oversimplification is a great error to be avoided … way too mechanistic… and thankfully humans are not machines…and thus there are always exceptions which must be given the credit they deserve… Such Mechanistic irrationalism is endemic to Objectivism… most believing such Ideas that “All Muslims are Evil”… “All Christians hate Gays”… Etc, yet there is a moderate minority who avoid this error, and I give these Libertarians their due. I am angry about the amount of effort the Objectivists put into undermining the Campaign of Ron Paul, whom was by Far the best hope for saving America from Economic ruin and for implementing Libertarian reforms across the board. The source of this Irrational hatred has been hidden to a large degree and has left many people wondering why Objectivists hate Ron Paul..
Read what ‘Cornell’ has written on this subject on the Lindsay Perigo Objectivist Blog Solo…. 2. Foreign Policy — Rand and Peikoff take a much more hawkish stance. However, (1) most states are not going to ban abortions, so I don’t see his stance on abortion changing much of anything, except that he will take away federal subsidies for abortion, which Objectivists would be for anyway, and (2) the truth is that we need to take a less agressive stance towards foreign policy, if for no other reason than that we simply can’t afford to be fighting all these wars accross the globe — we just don’t have the revenue to support it anymore; and I think that Rand would agree with Paul on his strategy, if not on his premises, with the possible exception of Iran. So am I missing something, or does the Objectivists’ objection to Paul really just boil down to Iran? If so, then I’m not that worried about Iran. If America leaves Iran alone, you can believe the Israelis will pick up the slack. And you can’t tell me that the American private security firms won’t help out the Israelis with weapons and man-power should all hell break loose; there’s too much to gain by Israel winning another war in the Middle East unhinged from American intrusion. “ End Quote. This is the unpardonable sin in the eyes of Objectivism. Atheism is it’s First principle. And Objectivists willingly sacrifice the principles of Freedom for the sake of halting any Theistic champion of Liberty or justice taking the limelight… thus in spite of all their claims to reason.. they prove them selves to be irrational religious zealots/fanatics. In their minds It is unthinkable for them to accept the Idea that a theist could be the champion of Liberty and justice. To accept this they would have to abandon Objectivism because Objectivism is based upon Anti-theism… and it is this which attracted most of them to the faith. Peter Creswell clearly indicates this *Here* when he says Ron Paul cant be a Libertarian because he’s a Creationist… who will not draw a line between his religion and the State. Comming from a Randoid this is shear hypocracy… and not true, ie Ron Paul maintains a separation between his Religion and the state, and the fact that He is a Creationist whom rejects the theory of evolution does not render him irrational at all! PC speaks from his own Bigoted Anti-reason superstition. Thus The Title of my Blogpost and the Meme explains everything… why Objectivists helped the Powers of Evil in undermining the Greatest champion of Liberty in America today. Many Libertarian minded Kiwi will be gathering next Saturday to discuss the formation of a New Libertarian orintated Party to gather together the remnants of the Act Party, The Libertarianz, and others like the legalize cannabis party into an Electoral fighting force. It will not be an easy thing to achieve, esp if Objectivists hope to contaminate the constitution with their personal religion, and to put out Anti-theistic blogs and press releases in the name of the New organization. The only hope this New Paty has is that it establishes a true separation between personal beliefs and the constitution, and operates via a libertarian spirit of toleration… for mutual benefit. I have my own view about how such a party ought to be constituted and I hope to produce a blogpost in this subject before Next Saturday. 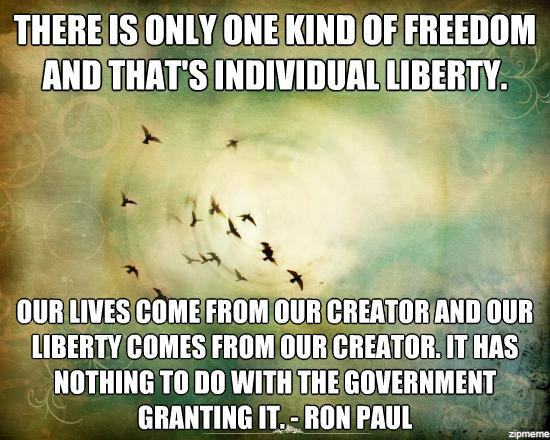 Objectivists would disagree with Ron Paul’s statement that liberty comes from our Creator, but they would agree with his statement that it has nothing to do with the government. Mark, I have substantially increased this post to better explain my accusation. I am saying The bulk of Objectivist Zeallots are Millitantly Irrational and intollerant…to an Unlibertarian extent. They Put their Bigotry ahead of the cause for freedom…. they value Athesm more than Freedom.